Your home videos are about to get the Full HD treatment in the 'easiest and most affordable way', according to Samsung. 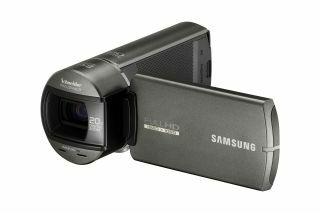 The Samsung HMX-Q10 camcorder records in 1920 x 1080/60i Full HD, with a 5-megapixel BSI CMOS sensor for super-sensitivity - meaning 4.9-megapixel still images as well as Full HD movies. This means you'll be able to capture better video in low-light conditions, as well as enjoying the sharp crispness of full HD home videos. The shaky-handed will be pleased to hear that the OIS Duo system helps provide a stable image; no Blair Witch effect here, thank you very much. With a handy Switch-Grip system, the HMX-Q10 recognises the angle at which you're holding the device and turns the LCD display accordingly, so you're always aware of exactly what you're recording no matter which hand you're holding the unit in. After some intense consumer research, the company has found that simplicity and affordability are key priorities for camcorder users - we'll just give you a minute to recover from the shock of this revelation. In the interests of simple operation, Samsung has implemented a brand new Easy Operation and Smart Access user interface, purporting to make it quicker and easier for you to playback videos on the 2.7in LCD screen. Despite promising affordable full HD, Samsung is keeping us guessing when it comes to the price of the HMX-Q10; we contacted them to ask for a retail price but no word yet. The Samsung HMX-Q10 will be available in March 2011.